I guess it's normal to be wide awake at 2AM for a race that starts at 7AM. I hadn't planned on getting up so early but a combination of nerves along with drinking a half-gallon of water right before bedtime may have added to my sleeplessness. My girlfriend warned me before I downed it but I guess I'm hard headed and wanted to get that extra little bit of hydration in before the race. What followed was a steady trip to the bathroom every five minutes. I followed the "words of wisdom" from previous marathoners knowing that I probably wasn't going to get a good night's sleep the night before the race so I got a 'straight eight' on Friday night. So, there I lay in bed from 2AM to 5AM tossing and turning all the while seeing the prize, the finish line of the marathon, in my minds eye. That thought was not new to me. I often pictured what the finish line would look like during my training runs and most of the time it choked me up. Each of my three separate alarms started blazing at 5AM. I was already wide awake so I hopped out of bed and started dressing for day ahead. I placed all my racing 'gear' out on the table the night before which included my racing belt with my "464" bib number, my gel packs in the racing belt pocket and my clip on 4 ounce water bottle holster. Breakfast consisted of half a bagel with some peanut butter smeared on top and around 4 ounces of coffee. I slathered a copious amount of sun block on my folically challenged head and double checked all my gear and especially made sure that my timing chip was securely fastened to my shoe. I read about a fellow marathoner losing his timing chip at his first marathon at Disney and I can't imagine how frustrating that must have been. I was out the door at 5:45 feeling both excited and scared of what the day had to offer. The air was crisp and heavy but there was no wind as my girlfriend and I started the half-mile trek from the hotel to the Superdome. The hotel we stayed at is the same hotel that my friends and I park at when we attend the Saints games. The only difference about the walk today and on Saints game day is that this walk will be made without a Bloody Mary in hand. As soon as we exited the hotel we found the nearest news stand distribution box and bought a copy of the Sunday paper. I flipped through the sports section to see the article that Michael Montelbano, a new friend, fellow marathoner and reporter for the Times-Picayune, wrote about me. I was absolutely floored by what I saw. The article itself was amazing and very well written but to make it even more impressive is that it spanned two pages complete with a couple pictures and a nifty 'quote' box you often see in magazines. It was very uplifting and a great to start to what was shaping up to be one of the most memorable days of my life. We arrived at the dome around 6:20AM and we walked around a bit until I found a clear patch of space where I could start stretching. Before I knew it it was 6:55 and Mike Cambre, the race director was introducing the guests of honor to start the race and sing the national anthem. The crowd of racers was thick and I'd say I was probably around 150 yards from the starting line. Next thing I know the race horn is blown and off I go. I kissed my girlfriend goodbye and then I was off. The crowd of racers slowly shuffled to the starting line and finally spread out a bit to allow everyone to jog across the mat on their way to Poydras Street. 26.2 here I come! We ran down Poydras for what I assume was around half a mile and made a turn onto the street leading up to Bourbon. I passed Hunter McAllister, one of my best friends, my training partner and the person that single handedly motivated me to keep moving during the final part of the race around the intersection of Loyola and Poydras. Hunter was supposed to be on the course with me but he hurt his knee doing stadiums a month or so ago and then aggravated the injury again within the last few weeks and he hasn't been able to train. (Please go to the doctor Hunter. The LA Triathlon is just over 2 months away!) He definitely deserves much of the credit for me finishing the last 6 miles but I will get into that soon enough. As I crossed Canal Street into the French Quarter I found it amusing seeing the partiers that were still 'out' from last night trudging along outside the still open bars on Bourbon Street. Personally I thought they were crazy to be up from the night before but I'm sure that they were probably thinking the same thing about someone wanting to get out and run 26.2 miles. I made it a habit of glancing at my watch every 30 seconds or so to see my pace. I was holding steady at 8:45 and even though I KNEW that was too fast but I felt good and nothing was hurting so I tried to enjoy the quickest trip down Bourbon Street that I've ever done in my life. This fast pace (8:45 IS fast for me) will come back to haunt me around mile 18. I remember speaking with Mike Cambre a few days before the race and of his warning to not get caught up in the "fast start" because it will hurt me down towards the second half of the race. Oh how I wish I would have heeded that warning. I kept an eye out for one of my favorite bars, Lafitte's Blacksmith Shop, but I don't recall seeing it and now that I think about it we may have turned off to get to Royal Street before we passed it. The crowds on Royal Street seemed to actually be out to cheer on the runners rather than the being the late nighters that were on Bourbon. I remember passing at least two of the race photographers sitting on the side of the road and since I was still feeling pretty good I tried to flash a little smile. Actually I don't think I needed to flash a smile because I know I had a grin on my face the moment I crossed the starting line and I'm sure it was still in place. We crossed over Canal Street onto St. Charles when I first saw my girlfriend Beth. I gave her a quick wave and started on my long trek down St. Charles to Audubon Park. At this point in the race, which was around mile 3, the thoughts going through my head were of disbelief. 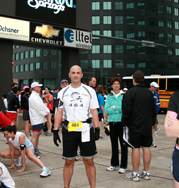 Was I really running a marathon? It definitely brought a tear to my eye as my mind raced between the many months of training and the weight loss journey that I had undertaken just over 23 months ago. I still felt good up until mile 5 or so when we got into the residential district on St. Charles. I started to experience twinges of chest pains and realized that it was probably because I wasn't drinking. I saw an aid station 500 meters or so ahead and shuffled off to grab some water and Gatorade. Within a few hundred feet the chest pains were gone and I was feeling good again. As I glanced at my watch my pace was still holding steady at around 9:15 minute miles. It wasn't long before I saw the NOPD motorcycle cops leading the front runners on their trek back to the dome and the half-way point. As the lead runner passed I was amazed at the fluidity of his stride and how very fast he was moving. I honestly don't think I could hold that pace for 100 yards much less 26.2! At around mile 7... Wait, let me make a correction... What I THOUGHT was mile 7 I got my first setback of the day. I looked down at my watch and it read 6.8 miles. I knew that at around mile 7 I had another aid station to grab some fluids. I looked back down at my watch and it said 6.9. Hmmm.... I should see the 7 mile marker and the aid station because it should only be a tenth of a mile away. Wrong! I can't describe the sick feeling I got in my stomach when I finally crossed the 7 mile marker and my watch said 7.25 miles. Could my watch really be off that much? It was dead on for the first and second miles. When my foot touched the invisible line crossing the road to mark the 1 mile point my watch rolled over to exactly 1 mile. The same thing happened when I hit mile 2. Mile 3 it was maybe .02 off and I didn't really bother with it again until it was too late and I hit Audubon Park. My mind started racing thinking thoughts such as, "You THOUGHT you ran 20 miles 3 weeks ago on your long training run but you actually only ran around 18," and "This 26.2 mile run will actually be around 30 miles on your watch." Fear started to get the best of me and thankfully I saw Hunter standing on the side of the path cheering me on right before mile 7. He listened as I bitched and complained about my watch while we ran for a half mile or so. He stopped around the golf course clubhouse to get in his car so he could meet me at City Park for the second half of the race. I exited Audubon Park onto St. Charles just before mile 9 on the long trek back to the Superdome which will be the half-way point of the race and the first time I will get to see my family. I still felt good and even with the setback I experienced with my watch there was nothing that was going to keep me from completing the 26.2. The sun was now out in full force but the trees that overshadow beautiful St. Charles Street blocked most of the rays. I must say that the day was beautiful and I couldn't have asked for better weather. The sky was bright blue and you couldn't see even a hint of a cloud. On the trek back down St. Charles I had a few onlookers recognize me from the Times-Picayune article that was in the paper that morning. It was very motivating to hear, "Hey 464, are you the guy from the paper? What a great story!" I'd give them a thumbs up, nod and let loose a big grin. Every time that happened throughout the day it felt great and it gave me that extra little push I needed to get to the finish line. I don't know the names of most of the streets we ran down to get to City Park but the crowds were very light compared to St. Charles and the first half of the course. I went from kinda looking forward to the aid stations to grab some fluids to desperately looking around the corner for the next one. My pace slowed... considerably. I kept moving forward though. I HAD to finish. When I turned onto road that skirted the perimeter of City Park at around mile 15 I started to feel the twinges of exhaustion. When exhaustion comes over me it starts in the top of my back around the bottom my neck and radiates out towards my shoulders. It was at this point I started to doubt my ability to finish the race. The crowds at City Park were non-existent. You can imagine my excitement when I saw my good friend "BBQ" Dave Gamgee at an upcoming intersection jumping and cheering for me taking pictures. BBQ, you may not know it, but those few moments I got to say hello and give you a high five helped me to make it another few miles. Thanks so much man! The aid stations, from this point on, all had what I've heard referred to as the "quitter buses" or the "meat wagons". You can hop on the bus if you get injured or you don't want to finish the race. I would be lying if I didn't say the thoughts of hopping on the bus weren't entering my mind. At this point there were periods when I was walking a two or three hundred meters after an aid station before I started running again. My knees started to ache, I started to get sick from the carb gel packs and Gatorade and I seriously started doubting my ability to finish. This, my friends, around mile 18, is about the time I hit "the wall". So what is "the wall?" you may ask. The wall is that point in a marathon where the wave of fatigue you experience is SO strong that you feel like your body will literally melt onto the street. Dizziness, disorientation, cramping, nausea, wobbly legs, knees locking up, muscles feeling like they will snap... All symptoms of hitting the wall and I was experiencing each and every one mentioned above. Each time my foot hit the pavement I felt a wave of pain shoot up my leg and travel the length of my body up to the top of my skull. I wore a mp3 player with music for the entire race but during this period to the end of the race I can honestly say that I don't remember the music. I know it was on but I was so out of it I didn't hear it. When I hit mile 19 I saw BBQ again shouting and cheering for me. I swung by again to shake his hand and thank him for coming out to support me and I continued on my trek to the next aid station. I was no longer on a trek to the finish. I just wanted to make it to the next aid station and I would take it from there. Hard or difficult isn't a good way to describe 20 - 26.2 for me. My walks after the aid stations broadened to 400m before I would start to run again and the sickness, nausea, stiffness and exhaustion I was experiencing in what felt like every muscle of my body was overwhelming. My body was definitely pleading with me to stop. My heart thought otherwise. I knew that the last 6.2 miles were going to be hard but I don't care how much training I have done I really wasn't prepared for what I was experiencing. As I suspected it was 100% heart that would get me through the last leg of the race... and my buddy Hunter. Hunter had already shown up a few times earlier in the race to cheer me on and push me when I was still 'fresh' and I actually had my legs. The next time I saw him I was a trotting zombie just before I passed mile 21 on the far side of City Park. I was getting the cramps that I often get after eating high carbohydrate foods which I knew would be a challenge for me because after all the gel packs and Gatorade ARE mostly sugar. I was leaning over clutching my stomach trying to make the pain go away with Hunter standing next to me telling me to keep moving when a 60ish grey haired, race-walker stops next to me to check to see if I was OK. The kind lady patted me on the back and said, "Sweetie have you been eating?" I muttered out a response with a meek, "Yes, thank you. I ate some GU gel and I think they are making me sick." She asked, "Baby, do you want a marathon bar, a gel pack or some water? You know the aid station is right up ahead right?" "No thank you," I replied, still slumped over massaging my calves, knees and my stomach, "I'm gonna get moving. I'm just cramping a bit." "OK sweetie," she told me. I stood up as straight as I could, glanced at Hunter then back at the lady and asked her, "Do I really look that bad?" She and Hunter chuckled and she responded, "Well sweetie it looked like you were struggling a bit. I just wanted to check on you. You hang in there. You're on the home stretch now and don't have far to go." And to answer the question that's probably in your head now, YES, I was eventually passed by quite a few race walkers and by some people that had some of the strangest running styles I've ever seen in my life. Some ranged from totally hunched over to others that had both hands unmoving in front of their face similar to a boxer defending his face from punches. I salute all of them because they eventually crossed the finish line just like me. Who am I to critique someone's running style? Hunter continued to motivate me quoting Yoda from Star Wars thinking it would cheer me up and keep me moving forward. "Come on man. Keep moving," Hunter said. "I'm trying man. I'm broken and having trouble breathing," I replied back. "There is no TRY! There is DO or DO NOT," Hunter said with a grin on his face. 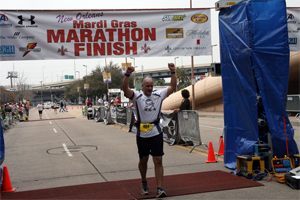 We turned into City Park and were FINALLY moving back towards the Superdome and the finish line. I've laughed with him now about how he kept telling me, "Man, seriously, there is an aid station right around the corner." Of course we would get to said corner and there wouldn't be an aid station. His response would always be, "Aww man I'm sorry it was the next corner," which just happened to be around a half mile away. We played that game for at least a mile until we came upon the last aid station in City Park and I was within one of my morning runs (4 miles) away from the finish line. Hunter got me through City Park. Period. I can't thank him enough for his motivation and his support not just on Sunday for the marathon but throughout the last 2 years. He's always been there for me motivating me and telling me about that 'aid station' right around the bend. Even when all I could do was walk a mile around Southeastern Louisiana University Hunter was right beside me pushing me along and making me keep moving forward. You are an inspiration man and I can't thank you enough for being my friend. Hunter peeled off shortly after I exited City Park so he could get back his car and make it to the finish line of the race. This was only after he sprinted to the store to get me a bottle of cold water because I was refusing to eat another gel pack with the hot water I had in my jug on my hip. I threw up shortly after taking in the "Espresso Love" GU Gel pack which I DO NOT recommend. Gel packs by nature are nasty, nasty, nasty. Imagine flavored, warm snot. They should actually label all their flavors as "snot" because that's what they taste like and that's my accurate description of them. I think I threw up because it was just plain nasty more than my body rejecting it. I did manage to get a bit of it down after I puked though. I took a few big swigs of the wonderful COLD water and hoped that it would be giving me 'the boost' that I so desperately needed within a few minutes. Well it did... Sheer willpower and that nasty gel pack boosted me all the way back to within a mile of the dome. I was starting to choke back the tears as I crossed each of the streets on Jeff Davis Parkway on my way back to the dome and the finish line. I guess it was at this point I KNEW I would finish. I thanked each of the NOPD officers and Orleans Parish Sheriff's department deputies as they blocked the streets and stopped traffic as I slowly shuffled by. Turning onto Poydras I got my first glimpse of the Superdome. There were no other runners within 200 yards in front or behind me at this point. The officer at the corner of Galvez and Poydras patted me on the back when he saw the tears streaming down my face as I turned onto the final leg of my journey. He wished me luck and said, "You're almost there sir. Almost there. You have to put it all on the pavement for me here." 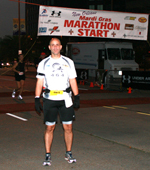 I mustered up everything I had and quickened my pace as I ran up Poydras. It's been two days since the race as I'm writing this and it brings tears to my eyes as I remember the emotions that I was experiencing as I ran the last half mile to the finish line. With tears streaming down my face I passed my sister and nephews and had the finish line in sight. My sister Jackie told me that she and my nephews were talking to me but I don't recall hearing anything she said. I didn't hear the cars as I passed under the interstate. I didn't hear the crowds cheering along the path to the finish line. I didn't hear the announcer calling out my name and my time as I approached the arch. I was inside myself. I was literally catching a dream by the tail. I had done it! I was about to cross the finish line of my first marathon! I had run 26.2 miles. Mike Cambre approached me shortly after I crossed the finish line and hung my finisher's medal around my neck and I was welcomed into the loving arms of my family and friends as they shared in my accomplishment. It was a great day for me. The greatest of days! I joined the .05% elite club of human beings on the planet that had run a marathon. It sure feels good! So what's next for Team 464 and Chad you may ask? Fast forward 18 - 24 months to Kona, Hawaii. It's 11PM and the humidity in the air is thick. Bib number 464 makes his way around the corner on Alii Drive with the finish line in sight. Tears streaming down his face he crosses the finish line as the announcer shouts out... "CHAD SOILEAU... YOU ARE AN I-R-O-N-M-A-A-A-N!!!" Thanks for reading and allowing me to share one of the most amazing days of my life. Best of luck on YOUR life journey!